Hello and Happy Monday! Hope you enjoyed our Holiday Release last week! I'm taking a slight break from the Christmas cards today to share this sweet Fall card. It's beautiful Fall weather right now in Wisconsin! We are enjoying changing leaves and apple orchards so I thought it would be fun to share this apple card today! 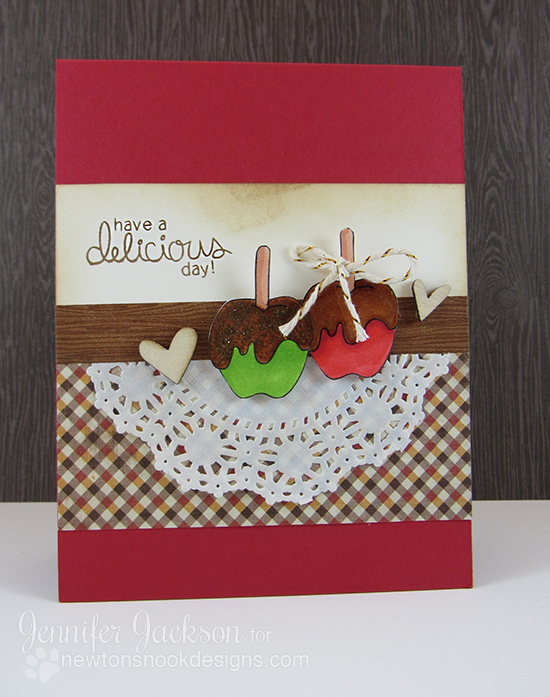 I used our the cute little caramel apple image from our Apple Delights stamp set and colored two apples - one red and one green - with copics. Then I fussy cut them out and added some distress stickles on the caramel of one of them. For the other one I added a small bow with some sparkly bakers twine. Then I created a card with some fun fall colors and plaid paper. I also added a piece of wooodgrain washi tape, wooden hearts and a doiley. 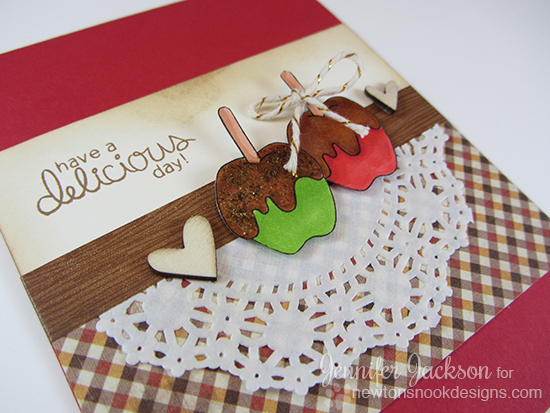 The "have a delicious day" sentiment is also from the Apple Delights stamp set. Thanks for stopping by! Hope you are having a delicious day! If you haven't had a chance to check out our Holiday Release, you can see it in our shop now here. Awww, that is darling and mmmmm, those caramel apples look good! such a cute card.. yummy apples.. Delicious, indeed! Those apples make me smile! Such a sweet card, love those cute little apples! There is something seriously wrong, if I look at a card and think, Oooh that looks yummy. hehe Beautiful card!